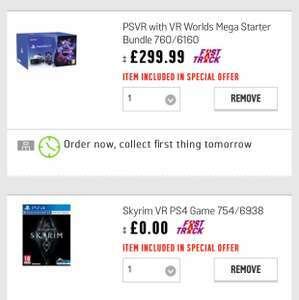 PlayStation VR with starter bundle, VR world and a choice of one of the following three VR games. Does anyone know if Argos are stocking the new model yet? Thought this was 250 has it gone up ? I got the £250 black Friday deal I haven't opened it yet or the game would argos let me take it back and swap out for the new one? 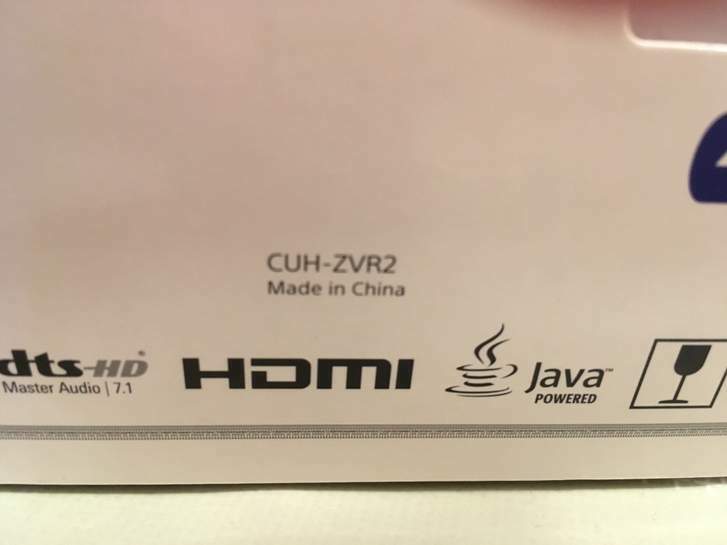 Its V1 but it only matters if you are lazy and require HDR passthrough. Are you 100% sure? If so, I'll definitely bite. 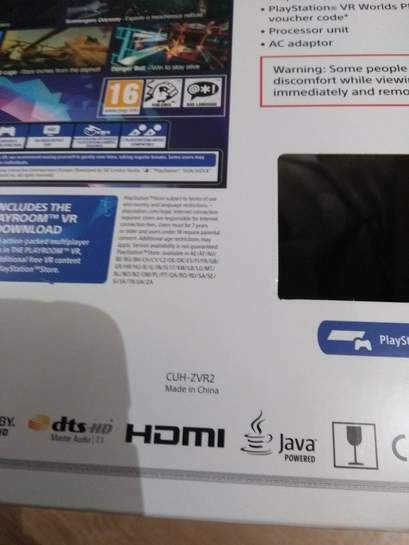 This exact one from Argos? This should get loads of heat, unfortunately missed out on the £10 voucher for over £100 spend as that ended yesterday! Mine came today! Mines a pressie from the OH and I am not allowed it until Xmas day! Excellent deal from Argos as many of us can get up to around 7% off vouchers through employee schemes and there is the Argos card for 12 months BNPL which is good. Heated! I'm not sure HDR passthrough and integrated headphones are worth £50 extra. Ummmm. Released in the UK in October. Best place to get a double pack of move controllers? I got the £250 black Friday deal I haven't opened it yet or the game would …I got the £250 black Friday deal I haven't opened it yet or the game would argos let me take it back and swap out for the new one? Yes. You can return within 28 days no questions as long unopened. I took mine back and got a refund then purchased V2 bundle from Smythes. You will have to return the game which was part of the bundle and i'm not sure if they'd let you have it as part of the new bundle. They may say it needs to be 'returned' and they are out of stock! But maybe they'll be flexible or it will be in stock anyway....hope that makes sense! And a lighter cable attached to it. And easier to sell on in the future maybe. But notfor everyone I agree. 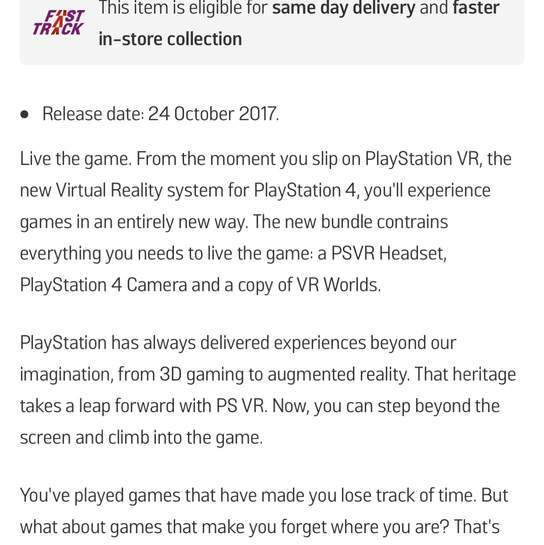 If I reserve this deal from Argos, will it definitely be a V2? How do these compare to an Oculus Rift? I tried an Oculus this week at a friend's house, no better visually than my GearVR but the hand controller element was cool which the GearVR can't do. The teleport thing instead of walking in games is hopeless though, I guess there's no way to counteract that without people puking. From my testing of the GearVR and Oculus Rift, VR is a cool but very niche product. The immersion is fantastic and I'm sure if my parents tried it they would be amazed, however the games aren't that great yet. Teleporting around whilst playing SkyRim well I'd prefer to just play it 2D and be able to walk about normally. VR has a long way to go yet. I rate it better than 3D but hmm it needs to get a lot better, the resolution needs massively upgrading, I'd say that 4K wouldn't even be good enough, 8K would be a decent starting point, anyway we're quite some way off that for PC gaming currently. How do these compare to an Oculus Rift? I tried an Oculus this week at a …How do these compare to an Oculus Rift? 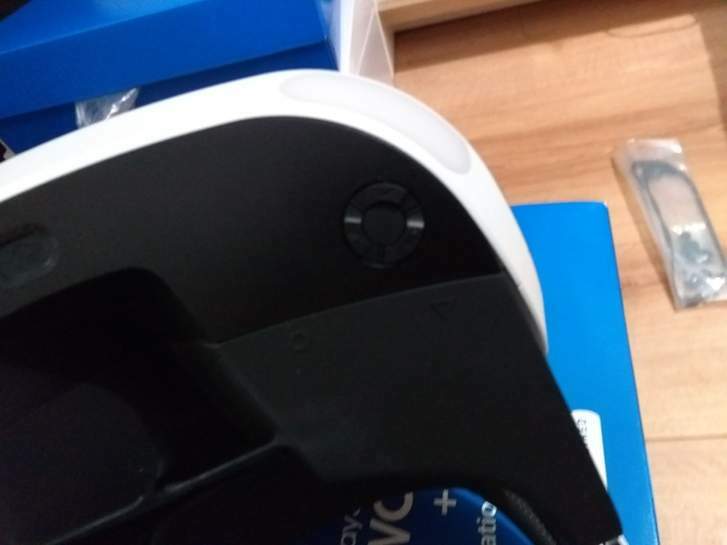 I tried an Oculus this week at a friend's house, no better visually than my GearVR but the hand controller element was cool which the GearVR can't do. The teleport thing instead of walking in games is hopeless though, I guess there's no way to counteract that without people puking. From my testing of the GearVR and Oculus Rift, VR is a cool but very niche product. The immersion is fantastic and I'm sure if my parents tried it they would be amazed, however the games aren't that great yet. Teleporting around whilst playing SkyRim well I'd prefer to just play it 2D and be able to walk about normally. VR has a long way to go yet. I rate it better than 3D but hmm it needs to get a lot better, the resolution needs massively upgrading, I'd say that 4K wouldn't even be good enough, 8K would be a decent starting point, anyway we're quite some way off that for PC gaming currently. Only certain people get sick when using smooth locomotion in VR. I used smooth locomotion like normal from the start of Resi 7 and didn't feel sick after three hours of playing. Skyrim, Doom VFR, Farpoint etc. can also be played with smooth locomotion. There's a HMD being developed that has 4K for each eye and 200 degree FOV. 8K isn't that far off :). Thanks. 8K is really what's required from what I've read on the subject of VR. Also I notice that Kickstarter attempts to solve the peripheral vision issue with VR. So things are going in the right direction. The DOOM VFR that comes bundled with this is appearing as the HTC Vive version and not the PS4 version? Anyone else seeing that? Collected earlier today - v2 all round so I’m well pleased. Thanks Argos! I'm still not convinced :). A lighter cable would be nice, though I like where the volume control is on the V1 and having the choice to use different headphones. The padding seems fine to me. I think £20-£30 would be reasonable for me (a bit more than the price of a switch box). Version 1 in Argos Dudley. Taking it back once the white stuff is off the ground. Thanks OP. 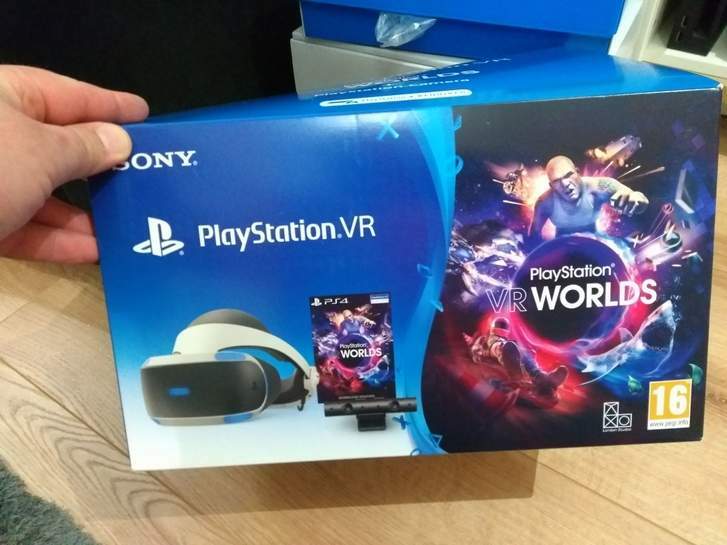 Picked mine up this morning in Newry with a copy of GT Sport. It was the V2 version. Have to wait till christmas to play it tho. Also got a copy of Resident Evil 7 VR for £20.